If you are looking for an appealing and cost-effective material to renovate your shower, stone veneers are an excellent choice. Remodelling your bathroom doesn’t have to be an expensive project. With stone veneers, you can achieve a designer look for a fraction of the cost of marble, fibreglass and wood. Being lightweight and easy to handle, it can be also be completed quickly. 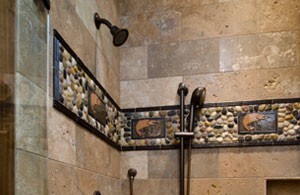 Showers with stone veneer accents have an elegant look and are easy to maintain. With the right tools, your shower renovation can become a DIY project. If you are an enthusiastic DIY renovator, here is a step-by-step stone veneer installation guide for you to follow. Cover the entire shower wall with a weather-resistant, plastic moisture barrier. It will protect the stone veneer and the wood underneath from moisture damage. Cover the moisture barrier with a metal lath. Make sure that the joints are overlapping with a minimum of 2-inches on the horizontal seams, and 6 inches on the vertical seams. Space the nails 6-inches apart. Prepare the mortar mixture according to the instructions on the packet and apply a thin layer over the metal lath. Rake with a mason’s scratcher or hand rake. Let it sit for 48 hours. Reference your design drawing and lay out the stone veneer pattern on the floor near you. Vary colours and shapes to add depth and interest. Spread a thick layer (about ½ to ¾ inches) of the mortar mixture onto the back of each stone and place on the wall starting at the top. Wiggle the stones back and forth until excess mortar squirms out from the side of the stone. Let it dry for around 30 to 60 minutes. Then use a trowel to push the mortar into the joints. Use a round stick to smoothen it out. Using a wire brush, go over the joints and the stones. Finally, use a broom to sweep over the stone veneers with a broom. Platinum Stone Veneer offers a wide selection of colours, shapes and textures. Our experienced staff can help guide your selection as well as provide design and installation advice. Should you decide to opt for professional installation and ensure the success of your project, we will be happy to provide this service. To learn more about bathroom and shower installation,call Platinum Stone Veneer (416) 731-8600 or request an estimate online.